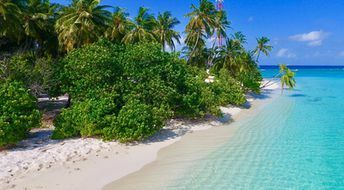 This island ranks #12 of the "Best atolls in the Maldives"
Vaavu atoll may offer a lot of guesthouses with rooms' fares starting from US$50 per night. Unfortunately, some islands are hardly overcrowded, so you should be carefull when choosing the holiday destination. - departure from Fulidhoo island at 11:00 on Monday, Wednesday and Saturday. - departure from Thinadhoo island at 9:15. There is also public ferry service between Male and Thinadhoo island running 1.5 hours per way. The round trip ticket is US$130 per person. Departure from Male is at 10:00 and at 16:00, departure from Thinadhoo island - at 7:00 and at 13:00. The best time for a holiday on the beaches of Vaavu atoll is a dry season from January to April.